Dare to Ask is a popular phenomenon in the Netherlands based on the idea that when people ask for what they truly want, the chances they will actually get it increases considerably. After all, there are plenty of people that are more than happy to help you along in realizing your dream. Imagine all the missed opportunities of people being happy to share exactly what you need for free, but not doing it because they didn’t have a clue you were looking for it. The scale of missed opportunities on a global level is huge! 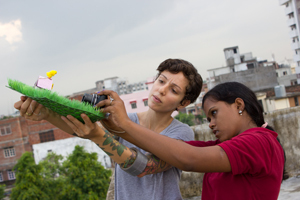 Dare to Ask makes “social surplus” visible and put it to good use. – PR and Marketing advise. We could use the help of a professional PR agency to help us make our promotional activities more effective. We have a great story to tell, but how do we get it out there? – Video of FairMail teenagers. On our new website (coming soon!) we want to include a personal video about each FairMail teenager on their personal profile page. Who would like to dive into their lives and tell their personal stories in short 1 minute videos? 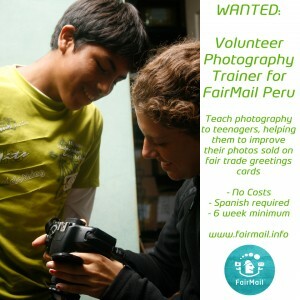 – Volunteer Photography Trainers in Peru. The FairMail team in Peru is looking for enthusiastic volunteers with a passion for photography, who speak Spanish and have 6 weeks to give photography training in Peru. Do you know anyone looking for this enriching experience? – Television and media contacts. For our upcoming promotion tour with the two Peruvian FairMail teenagers we are looking for journalists and other media contacts in Germany, France, Belgium, The Netherlands and Switzerland. – Things to do for our teenagers during Promotion tour. For our upcoming promotion tour with the two Peruvian FairMail teenagers we are looking for places to visit and people to guide us. Places that are interesting for the teenagers to see (schools, cities, landmarks), but also places where they can promote their cards (festivals, shops, fair trade towns). Do you live in Germany, France, The Netherlands, Belgium or Switzerland and would you like to help make this the teenagers’ trip of a life time, then please get in contact with us!